"If stock prices or asset prices more generally were to fall, what would that mean for the economy as a whole?" asked outgoing Fed Chair Yellen during her exit interview, selling the all-time highs. "The financial system is much better capitalized. The banking system is more resilient," the former US central banker added, listing her accomplishments. "I think our overall judgment is that, if there were to be a decline in asset valuations, it would not damage unduly the core of our financial system." That was that moment when the "Yellen Put" instantly vanished, and stocks - predictably - plunged, while the industry’s most obviously ill-conceived financial innovations – inverse VIX ETFs - collapsed to essentially zero in the space of thirty minutes on the first day of new Fed chair's Jay Powell tenure. "I think it’s basically a market event, and these things can be healthy," stated Dallas Fed president Robert Kaplan, diagnosing Monday’s -4.1% S&P 500 epileptic fit. "I don’t think it will have economic implications. 2018 will be a strong year in America. We’re at or near full employment. I continue to expect three rate hikes this year," explained the former Goldman banker. 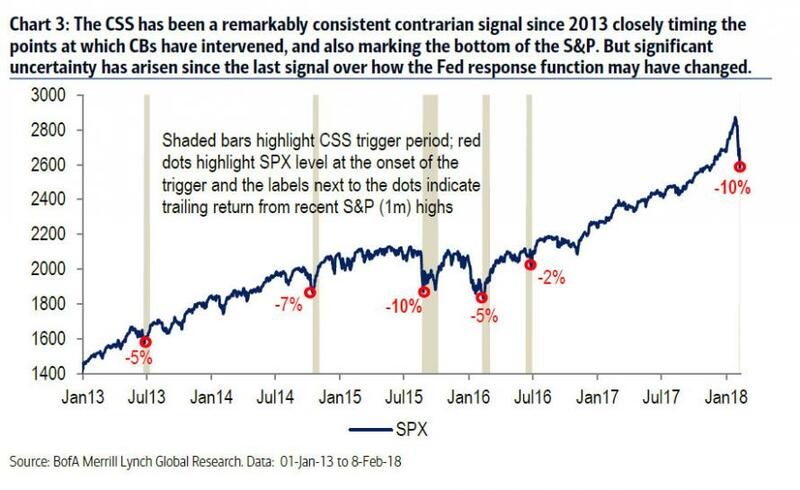 "This is the most predicted selloff of all time because the markets have been up so much and they have had so many days in a row without meaningful down days,” said Philly Fed president Bullard. "Something that has gone up 40% like the S&P tech sector would at some point have a selloff." he added philosophically. NY Fed’s Dudley chimed in at the end of the week: "An equity rout like the one that occurred in recent days has virtually no consequence for the economic outlook." Then on Sunday, Austrian central bank Governor and ECB member, Ewald Nowotny - in the most direct warning to liquidity addicts and market bulls yet - said "the recent drop in equities is a normalization, a reasonable wake-up signal to show that stock markets can’t just keep rising all the time,” speaking on Austrian television. "Behind [the drop] there is an expectation in markets that central banks will increasingly raise interest rates, and there are certain good reasons for that. The U.S. is expanding. However, one has to say that the task of central banks isn’t to satisfy markets but to ensure overall economic stability. So if necessary, interest rates will have to rise and markets will adapt to that." If the last week is any indication, the markets' adaptation to rising interest rates will be very painful indeed. Causing further indigestion among the bulls, Nowotny also said that Euro-area inflation still has room to move higher "so the ECB is still on the careful side. But that certainly won’t last forever. In the foreseeable future there will be a need for the ECB to raise interest rates, as is currently being done in the U.S."
... especially among retail investors who - despite the XIV implosion - have rushed right back and are buying inverse VIX ETFs as if nothing happened. ... what no one said was what’s most obvious. For every bull, there’s a bear. And the Fed would far rather have a bear market hit before the $1.5trln tax cut, $300bln budget stimulus and $90bln hurricane relief turbocharges one of history’s longest economic expansions. Than after. And if Peters is right, and the Fed is finally prioritizing the economy over the stock market, then "bombs away for risk assets" it is.